Copenhagenize.com - Bicycle Urbanism by Design: Go Green Live Rich and Use Us As a Reference! Go Green Live Rich and Use Us As a Reference! The postman just delivered a package from New York - by bicycle, of course. Okay, not all the way from NYC by bike, but the last leg at least. 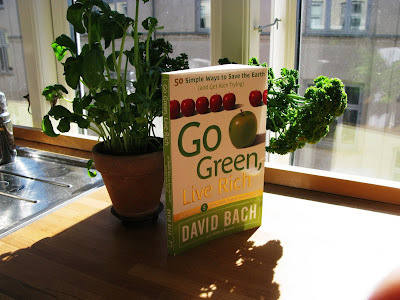 It's a copy of a new book by David Bach called Go Green, Live Rich - 50 simple ways to save the earth . I got sent a complimentary copy by the publisher because Mr Bach uses Copenhagen Cycle Chic as a factual reference, apparently. Which is, of course, very cool. And how nice is that, sending a complimentary copy? We're well chuffed about it here at the blogs. It was actually an excellent read. The book is geared for the American audience but there were still interesting tips and facts that are relevant to European readers. The book is, of course, available on Amazon .